The network-ready Konica Minolta Bizhub 20P is a workgroup monochrome laser printer. 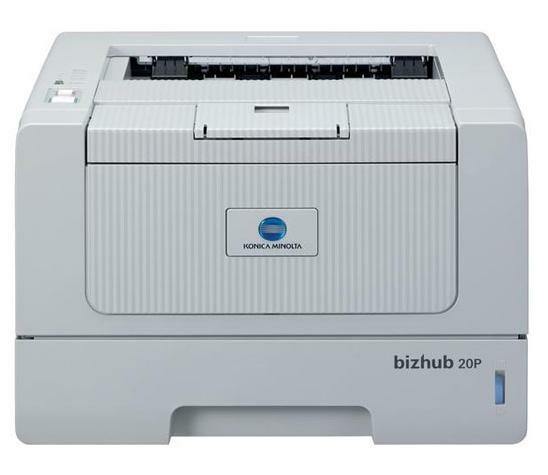 The Bizhub 20P laser printer is ideal for small offices as it is compact and comes with connectivity options including Ethernet for easy networking. The Konica Minolta Bizhub 20P monochrome printer boasts a decent print speed, but there are many newer monochrome laser printers that are much faster. Measuring 14.6 x 15.1 x 9.7 inches, the Konica Minolta Bizhub 20P workgroup printer is a boxy unit with paper trays that can handle 800 pages. Optional trays are available. For connectivity, the Bizhub 20P office printer has Ethernet as well as USB and parallel ports. Print speed can go as fast as 32ppm for black and white output. The replacement Bizhub 20P cartridge has the code TNP24 and will print reliably for an estimated 8,000 pages before expiring. The compact Konica Minolta Bizhub 20P black and white laser printer has an environment friendly design that can help reduce paper waste and conserve energy. It comes with built-in duplexer for automatic double-sided printing. With the Konica Bizhub 20P, users can expect crisp text documents to solid graphics. Networking is easy as the Konica Minolta Bizhub 20P printer comes with built-in Ethernet. The Konica Minolta 20P mono laser printer also comes with PCL6 emulation and PostScript 3 for better printing output. Though the Minolta Bizhub 20P printer is good for small businesses and workgroups, it cannot keep up with demanding environments. Paper handling capacity is low even with the optional 300-page tray. Although the Bizhub 20P can produce up tp 32ppm there are faster laser printers around.